April is one of my favorite times of the year. NSLS Scholarships & Awards applications are rolling in (giving those of us at the National Office a chance to learn about all the great work members are accomplishing), and many of our chapters are gearing up for their spring induction ceremonies. It doesn’t hurt that the days are finally becoming longer--and sunnier. This is also an exciting time for our members, as many of you are going through your Success Networking Team meetings, or finishing other steps in preparation for induction. Some may also be readying for graduation, or simply be excited that summer is within sight. This month, I encourage you to ride that wave of positivity and, if you’ll excuse the pun, spring forward in your leadership journey. When you look back at the goals you set for yourself this academic year, how many have you accomplished? Are there any that fell by the wayside that you can pick up and take on as you sprint to the finish line? This is a great time to evaluate what went right, what went wrong, and plan for the future. It’s never too early to get a head-start next year’s goals, whether long- or short-term. I wish you all a successful month, and congratulations to all of our new inductees! Continue Reading below in the Monthly Motivation section for tips on taking control of your leadership development. Join NSLS members in an opportunity to build leadership skills and for educational experiences outside of the traditional classroom. 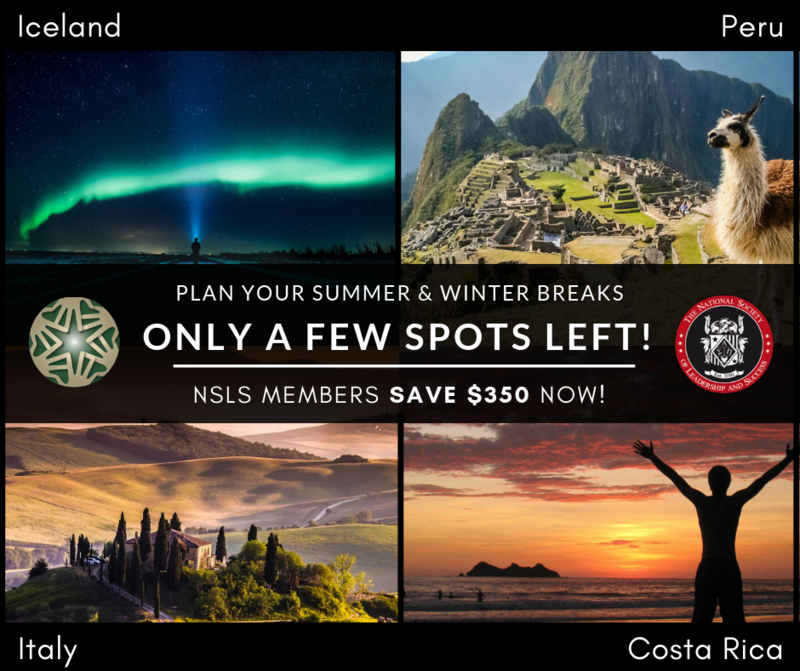 Through partnerships with True Nature Education, members receive exclusive discounts on carefully crafted and adventure packed immersive educational programs in Costa Rica, Peru, Italy and Iceland. These programs offer a week of adventure, culture, and service based leadership opportunities in some of the world's most sought-after destinations. Questions? Contact True Nature Education: info@TrueNatureEducation.com. The deadline to apply for NSLS Scholarships and Awards this season is tomorrow, April 5 at 11:59 pm EST. Applications will not be accepted after 11:59 p.m. EST tomorrow. No exceptions. For a list of available scholarships and requirements, and to download the scholarship packet, click here. We are looking for more applicants for the NSLS State of Mind award. If you are a member who has made a positive impact in your local community, click below to apply today! Click here to submit your application. If you have any questions, please contact awards@nsls.org. 2018-19 Mount St. Mary's Executive Board members Stephen Jackson, Morgan Weigle, Calleigh Kearns, and Kylie Kunzman. The NSLS chapter at Mount St. Mary’s University attracted more than 400 new members this year. More than 100 members have attended each of the chapter’s events thus far. "I was so impressed with the turnout at orientation this year!" Chapter Vice President Kylie Kunzman told Mount St. Mary’s University News. "It is amazing to see so many students willing to step up and become leaders." The chapter, founded in 2017, has been a hit with students. 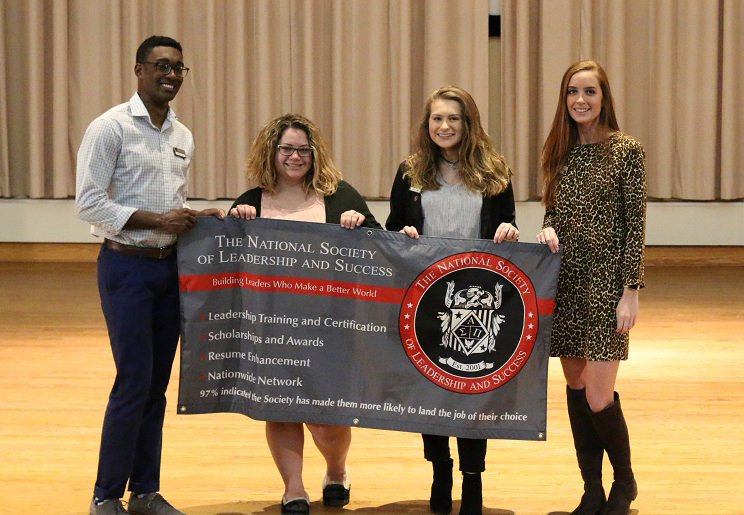 "I’m so excited for this opportunity to further develop my purpose and passion through NSLS and the positive environment of my peers and leaders of this chapter," said member Megan Smith. "NSLS is helping me clarify my goals and how to achieve them with a deeper understanding." The NSLS chapter at Blue Ridge Community College is working to raise money to drill a well for the village of Martha, Kenya. Residents of Martha, many of whom are widows and/or HIV positive, must walk five hours to gather water to support other villagers and their children. So far, the chapter has raised $7,000 of the $30,000 needed to build the well. 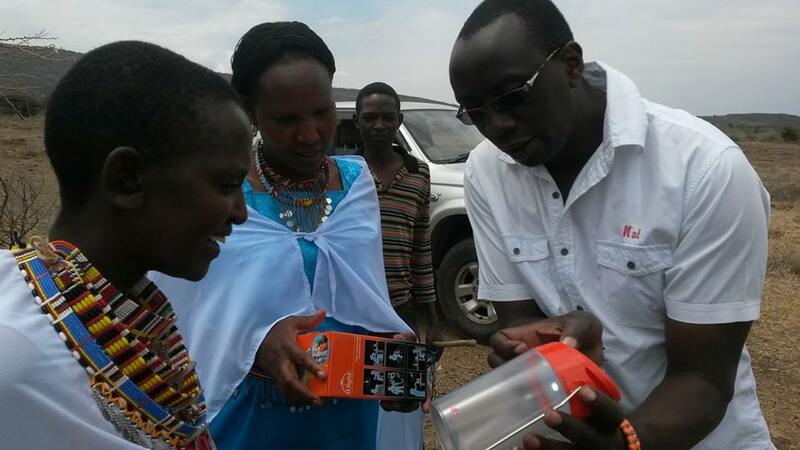 The BRCC chapter has worked with women in Martha previously, helping them to develop micro-businesses in livestock and agriculture. The chapter has set up a GoFundMe for anyone interested in donating, here. If your chapter would like to partner with BRCC on the drive, please contact BRCC Chapter Advisor Dr. Rebecca Evans, at evansr@brcc.edu. Who is responsible for ensuring that you develop as a leader in your workplace? If you believe the answer is "My company or my boss," you’re only partially right. Of course, your employer should play a key role, but their ability to be effective on your behalf really depends on their development philosophy and willingness and/or ability to invest in your improvement. If you aspire to progress as a leader, the buck stops with you — you must take control of your own learning and growth.